Three says it is “incredibly happy” with how Roseanne (7.30 Thursdays) is rating in this market. “We were incredibly happy with the performance of Roseanne‘s premiere episode, as it won its timeslot in 25-54, with a 4.7 rating and a 15.6 share,” a MediaWorks publicist says. Those figures combined Roseanne’s overnight audience on both Three and ThreePlus1. They dipped for the reboot’s second week, when it averaged 3.5% of 25-54s on Three, the network’s core commercial demographic, and 0.4% on ThreePlus1. But it was against tougher competition than the premiere: TVNZ 2’s top–rating Police Ten 7 (7.8% when combined with TVNZ 2 +1) and TVNZ 1’s Commonwealth Games coverage (4.0%). Even so, it still boosted Modern Family’s following, which averaged a combined 25-54 rating of 3.4%, and justified Three’s faith in snapping up the sitcom. Globally, Roseanne is being handled by Disney Media Distribution but Three was able to secure it ahead of DMD’s alliance with TVNZ. In the US, Roseanne is still a ratings powerhouse but viewership is ebbing. 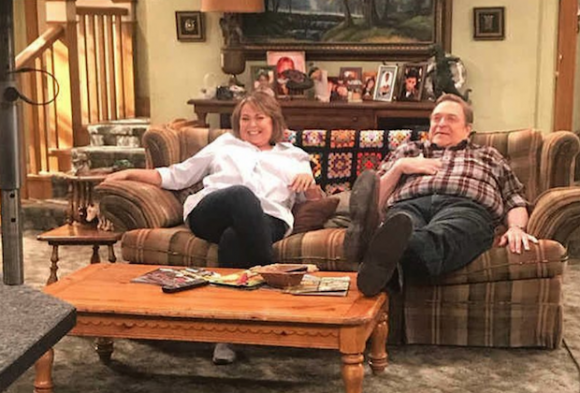 ABC’s revival of Roseanne was the top show of Tuesday night in the overnight ratings for the third week in a row, despite once again being down double digits from the previous week. Airing at 8 p.m., Roseanne drew a 3.4 rating in adults 18-49 and 13.5 million viewers. That is down approximately 13% in the demo and 12% in total viewers compared to last week, when the show drew a 3.9 and 15.4 million viewers. That is less of a drop off than the show saw between its premiere and its second week, however. The premiere drew an astounding 5.2 rating and 18.4 million viewers, airing two episodes back-to-back.